New in 1954 it served with Belfast Fire Brigade until the late 1980's when it was purchased by the present owner directly from the Brigade (Stanley Seymour was in charge of the workshops then...). It is powered by a Rolls Royce B80 8 cylinder petrol engine which also drives the ladder and the mid-mounted Dennis No. 2 pump. The Metz ladder was originally 125' when extended ,but was shortened to 100' to improve stability. All ladder operations are directly mechanically driven by drum type winches, although a hydraulic system is used for the engagement of the ladder drive clutches. The crew cab was fully exposed on this type of appliance, which presented a safety problem to the exposed third man during the riots on the streets of Belfast during the 1970's. The Brigade workshops therefore very neatly enclosed the open crew cab. OZ9607 came out of service also with other useful accessories such as blast proof secondary glazing to the windscreen and side windows. Sorry Barry i don't have any pics of this appliance in use, it was in service a wee bit before my time!!! I do know that the exposed bit was like a "cubby hole" where the 3rd man sat. I believe this appliance spent it whole operational life at the old Belfast Central Station when it was on Chichester Street (the 'Chi'). In 1967 it was replaced by a AEC mercury 7 Merryweather 100ft TL (reg no 383 TZ) & became a reserve appliance. The "secondary" glazing on N.I appliance windscreens was designed to project the crew & if the screen was smashed on a "Civil Disturbance" call it could be kicked out & the secondary glazing closed over in it's place. This "secondary" windscreen (2 bits of sliding persex) is still fitted to all Northern Ireland FRS appliances to this day. Added by Bryan Sweeney on 29 December 2006. For your information it was Stanley Sefton who was in charge of the belfast workshops. I was trained as a T L operator in 1976 using this appliance and operated it at incidents over the years until it went out of service around 1986. Added by Joe Sloan on 04 January 2007. 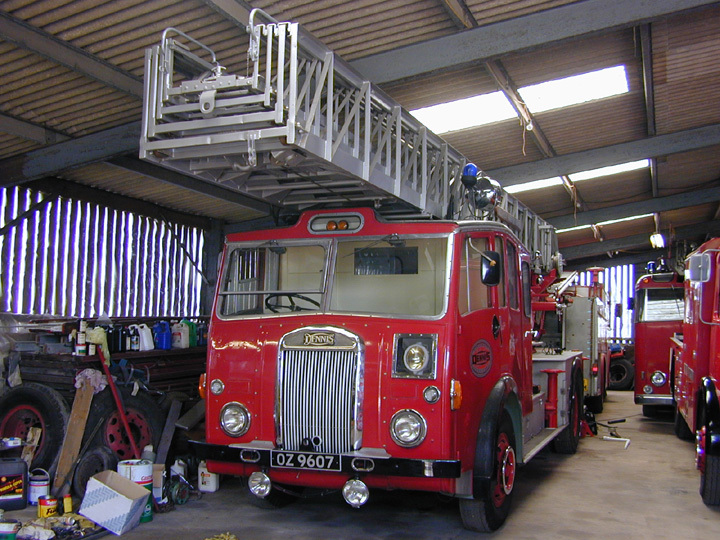 Hi Barry, re your questions about the Leyland TL's on Anglesey and the fact that you are after a top section ladder for 'whizzy' I'm reliably informed that they are EMX122 (under cover) which I thought had been destroyed by fire in 1964 which has a 101' ladder and the derelict one outside is a former Liverpool TL either EKA or EKC both of which are 104' ladders although five section, so I would guess that the ladder would be shorter than 'whizzys' hope this is of help. Rick Loudon. Added by Mark Loudon on 04 March 2007. Added by Ashley on 08 October 2007. Added by Stephen Chapman on 07 January 2009. Added by Michael malone on 18 December 2015.